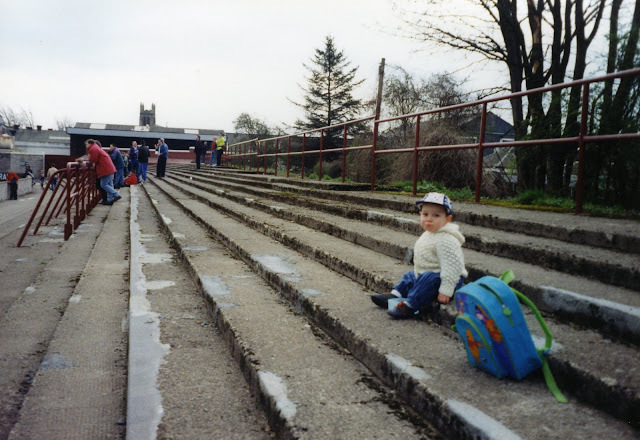 I was going to say this match was Son’s first, but that is not strictly true as he had already been wheeled along to a number of Bathgate Thistle matches – his first at the age of 5 months. 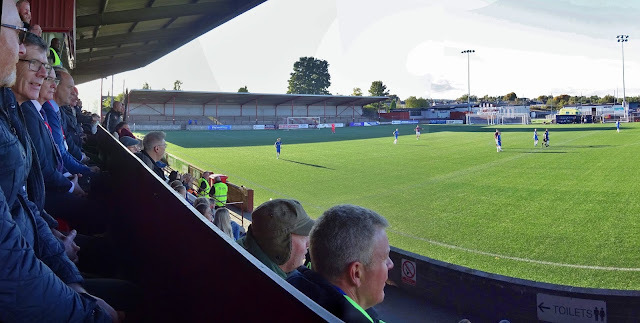 This trip to Ochilview was, however, his first to a senior ground, a fact which seemed to inordinately annoy the guy in the refreshment hut. “How is he gonna ken which team tae support, if you keep taking him to different grounds? You’ll just confuse the laddie” ran his objections; plainly viewing dragging a child ground-hopping just one step above sending him up a chimney. It was not my first visit to Ochilview. That had been way back in the spring of 1986 to watch Bathgate play a midweek friendly. My over-riding memory of that particular evening is one of basking in the wonderfully sweet aroma wafting from the McGowans Toffee factory next door. The factory was still there in 1998, but they plainly did not make toffee on Saturday afternoons. Both on that visit and this, I took the opportunity of sitting in the old wooden stand (nicknamed The Dolls’ House”) for a spell. 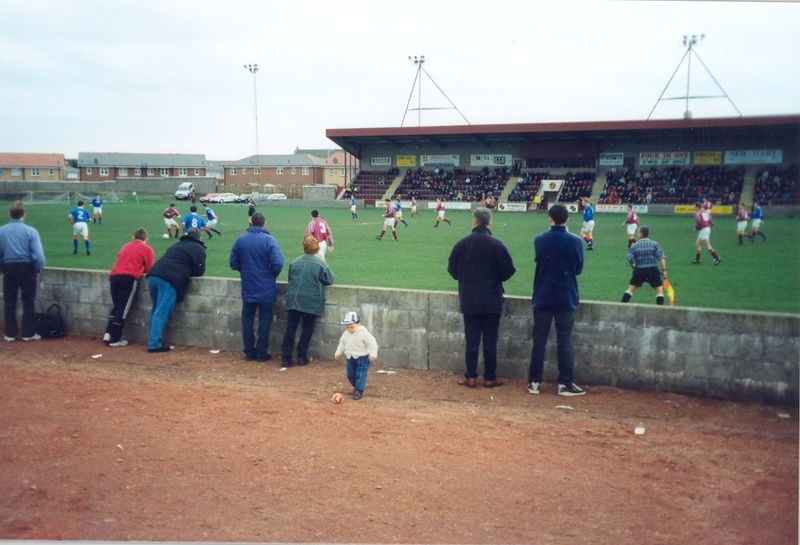 I enjoyed a connection with this stand, as it had originally stood at the ground of Bathgate FC’s Mill Park during the club’s spell in the Scottish League. 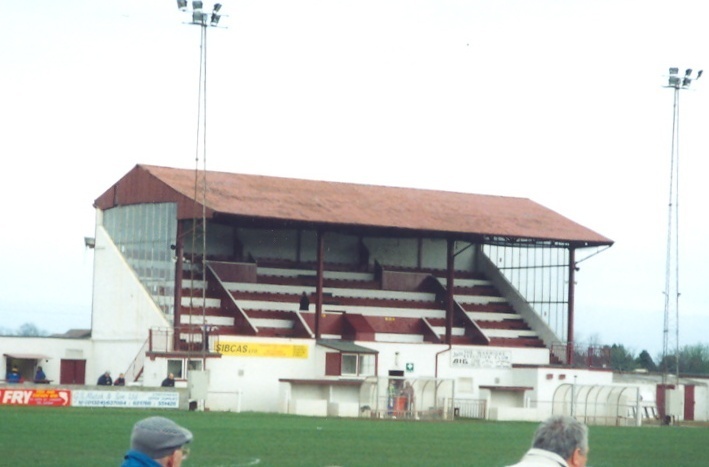 It was moved to Ochilview around 1930, and this relic from a bygone age was demolished in April 1999. ﻿﻿I had seen Stenhousemuir play a few weeks before and had not been particularly impressed but, despite being on the wrong end of the scoreline this afternoon, this had been a much improved display. Indeed, I felt Stranraer had been mightily fortunate to sneak away with both points. 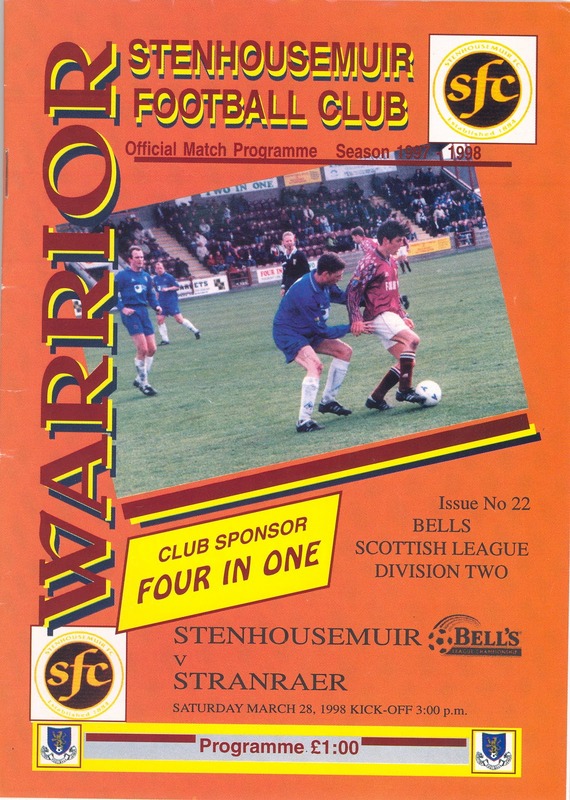 The only goal of the game came after 20 minutes when the visitors’ Dougie JOHNSTONE popped in a rebound after Warriors’ ‘keeper Neil Alexander had spilled a shot. Son, making his contribution to the standing or sitting at football grounds debate. players how it should be done. The old "Doll's House" stand, demolished 1999. 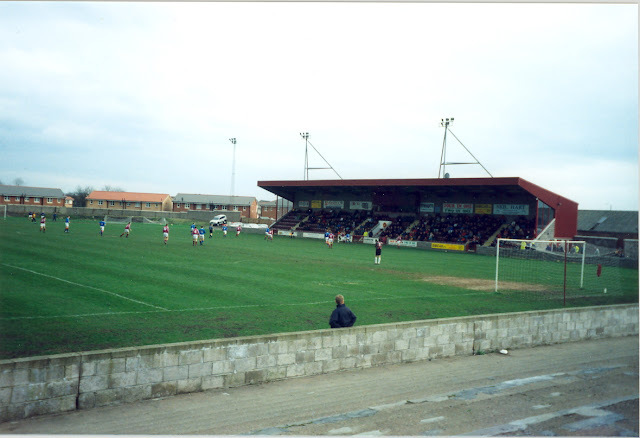 The "new" main stand, erected in 1996. 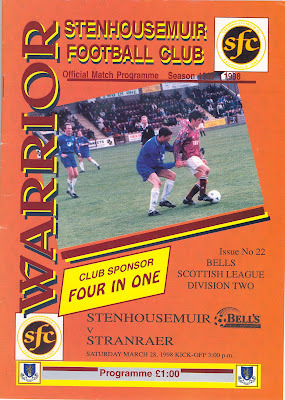 Stenhousemuir Supporters Club. It was used to house only home support today. The main entrance to Ochilview, Stenhousemuir. constructed over the Tryst Road end can just be seen. Montrose 'keeper Jordan Miller was pleased to see a first half free-kick by Jesus Garcia Tena miss the target. "You can shuv yir Arbroath Smokies up yir arse, etc, etc, etc." Not Iain Campbell's finest moment as he misses a 44th minute penalty. Moments later Montrose would see a goal chalked off for no-one was quite sure what. Sean Dickson clearly values his solar plexus as much as he does his nuts. Jesus walks above the carpet. Not sure that the old Bathgate stand was the one that was subsequently re-used as the "Doll's House" stand at Stenhousemuir FC (which was a new build following a fire in 1928) more likely the Bathgate stand was re-built as the cover on the opposite pitchside terracing that was there at Ochilview until the current main stand was built in its place in the mid 1990's. Thank you for your comment. That would actually make sense. I had chatted to an elderly supporter when researching my Bathgate Thistle history 25 years a go or so, and it was he who told me the former Mill Park stand had gone to Ochilview. But the Doll's House always struck me as a rather complex structure to have been dismantled and rebuilt. Perhaps, as you say, it was the enclosure (such structures also known as stands back in the day) which made the short journey across the Avon Gorge. Irrespective - it was sad to see the Doll's House go, and I was glad to have graced it with my hefty buttocks on a couple of occasions.